Pinch me to wake me up. This must be a dream or I’m on a special effect movie set: corpses floating in the river, fires burning deceased bodies, people bathing in and drinking a disturbingly filthy water that they call divine… But the smell makes it real and brings me to reality. A shocking meeting with a culture that is far beyond similar to what we know. Our ignorance squeezes our facial emotions with antipathy. Our mind is confused with a mixed of feelings and emotions. However, our eyes are wide open, strangely intrigued by what we see. Here we are, in Varanasi, one of the world’s oldest inhabited cities and the most holiest place for Hindus. 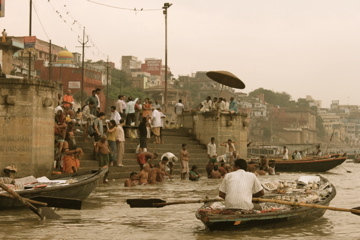 Varanasi is a city located on the banks of the Ganges River in northern India. This popular pilgrimage destination draws over a million pilgrims each year. They come to pray, wash their sins in the sacred waters and die on the banks of the river. For all, it is a journey of a lifetime. Shrines, temples and palaces are built on the water’s edge while nearly 100 ghats formed by a series of steps of stones lead to the river. We rent a rowboat to cruise along the Ganges and our 15-year-old oarsman briefly describes each ghats that we pass. Our voyeurism feels invading but seems tolerated. 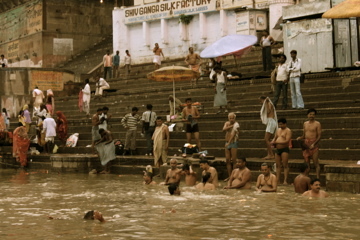 We catch sight of families, Hindu pilgrims, Sadhus, buffalos, dogs and goats all bathing, purifying their bodies and washing away a lifetime of sins in the sacred waters of the Ganges. While I am holding still in the boat, hands tight on the sides, I feel a hairy carcass slightly touching my hand. I look down and see the inert body of a dog, eyeballs out and white, floating free to decompose. My heart stops for a moment. I close my eyes, take a large breath. I look up and look around again. On one side, a man is washing white hotel linens on the muddy shores. On the other, a lady is sweeping trash and waste from one ghat in the water. 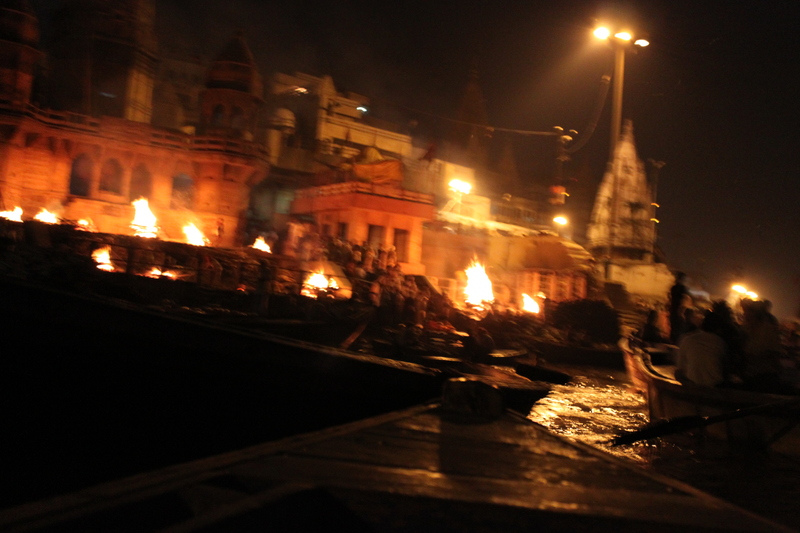 We approach the burning ghat where we see a boat rowing towards the middle of the river. A father drops the lifeless bodies of a child and a baby. They are both separately wrapped in a white sheet, bounded with ropes, attached by a rock. On the same side, a man is washing his body with the ashes of a person lost. A spectacular and unbelievable ritual of death and life, of black and white, where death meets purity. 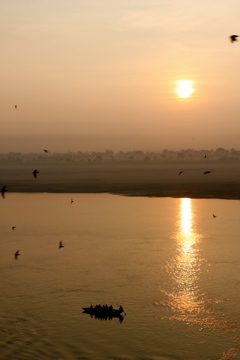 The moon is at its fullest, and here I am, cruising in the middle of the Ganges, astonished by the abundance of dead bodies, spirits and energies. 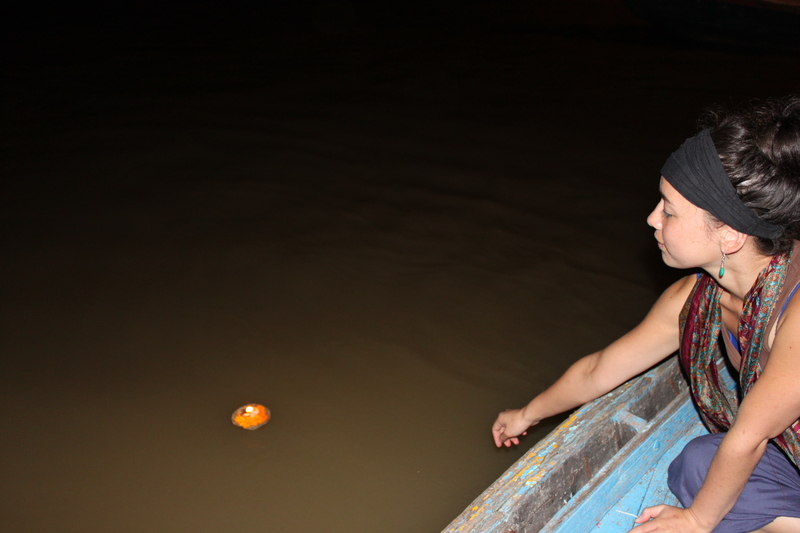 I light my candle, make a wish, and let it float on the river. Amongst others, it will make its way to its destiny and disappears in the moonlight. Some children are singing prayers and clapping bells on the stairs of a ghat while a Sadhu is performing a ritual ablution towards the moon. The Burning ghat offers a very intimate spectacle of death by cremating a dozen bodies in front of our eyes. Strangely, I am not scared, but embraced by a unique moment of darkness. Pure bliss. An experience that will live long in my memory.